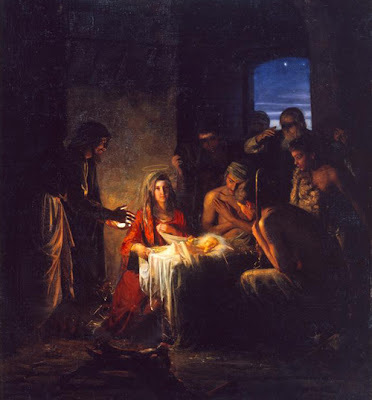 The first thing we are told about the shepherds is that they were on the watch – they could hear the message precisely because they were awake. We must be awake, so that we can hear the message. We must become truly vigilant people. What does this mean? The principal difference between someone dreaming and someone awake is that the dreamer is in a world of his own. His “self” is locked into this dreamworld that is his alone and does not connect him with others. To wake up means to leave that private world of one’s own and to enter the common reality, the truth that alone can unite all people. Conflict and lack of reconciliation in the world stem from the fact that we are locked into our own interests and opinions, into our own little private world. Selfishness, both individual and collective, makes us prisoners of our interests and our desires that stand against the truth and separate us from one another. Awake, the Gospel tells us. Step outside, so as to enter the great communal truth, the communion of the one God. To awake, then, means to develop a receptivity for God: for the silent promptings with which he chooses to guide us; for the many indications of his presence. There are people who describe themselves as “religiously tone deaf”. The gift of a capacity to perceive God seems as if it is withheld from some. And indeed – our way of thinking and acting, the mentality of today’s world, the whole range of our experience is inclined to deaden our receptivity for God, to make us “tone deaf” towards him. And yet in every soul, the desire for God, the capacity to encounter him, is present, whether in a hidden way or overtly. In order to arrive at this vigilance, this awakening to what is essential, we should pray for ourselves and for others, for those who appear “tone deaf” and yet in whom there is a keen desire for God to manifest himself.